Just Released! The ‘MPC Renaissance & MPC Studio Bible’ is the complete guide to using the MPC Renaissance & MPC Studio with MPC Software 2.1, packed with practical, ‘hands-on’ beat making projects that teach you everything from core beginner’s concepts all the way up to advanced power-user techniques! Plus many, many more pro tips, tricks and shortcuts! 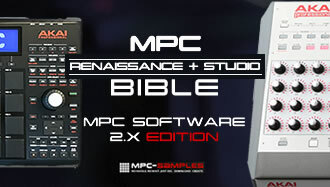 The ‘MPC Renaissance & MPC Studio Bible’ is the completely essential resource for all MPC Renaissance and MPC Studio owners running MPC Software 2.x – available to download instantly after purchase! I was hesitant to buy the new MPC X and MPC live because I have the Renaissance and studio black. I really never knew how to perfect the equipment I had so why buy new equipment. I tried the Maschine and FL Studio to help me create, but it was always something about the MPC that made things simple to me. I told myself I am going to find something that will help me perfect my equipment and I found this website. I bought the book literally two days ago and I have already finished it, all 473 pages and I am more proficient with the MPC than I ever was!! No need to buy new equipment when what you have works perfectly fine. You are a life saver and thank you for making this book that even a child can understand. Everything was well thought out and explained. I will buy the X and live in the future, but when I do, if I do not understand it, I am going to buy another book from you. Thank you again for taking the time to make this book. Better than any YouTube video. I have the mpc studio black and mpc 2.2. Will this cover everything in the update? Hi, the book was written using MPC Software 2.1 so the existing tutorials all compatible with 2.2, but it doesn’t currently cover the new features that were added in 2.2 (e.g. random note generation, midi learn, humanize). Could I use this without the hardware to learn how to use the software? It does have reference the software GUI throughout the book, but the primary focus of the book is on using the hardware to control the software, so most content is shown from the blue screen.